CK: I know THE THING Quarterly is a collaborative effort between you and Will Rogan. How did you guys get started on this project? You both sustain your own art practices, so give me a brief history of THE THING. JH: When Will and I met, we were very interested in collaborating with each other on projects. Our art practices were not exactly lined up, but we got along really well. We tried a couple of collaborations and they were just … terrible. But we just kept talking about doing some kind of a publication. We were very inspired by McSweeney’s here in San Francisco. In particular, the way that they would play with the object of the periodical, the way that they would always try to change the way a periodical would look. We were very into that. We both were and still are subscribers. We just kept talking about how great it would be to have an object and text put together. And eventually, we were given a residency at Southern Exposure. So that is more or less how it began. And it just exploded from there. JH: Yeah, we didn’t go into this thinking that we would run a business. We thought there would probably be 25 people who would subscribe. It was kind of an idealistic thing. And it still is, but it has obviously changed a bit more. It was very much just hands on. We had Miranda July, visual artist Anne Walsh, visual artist Kota Ezawa, and Trisha Donnelly. It was a really amazing lineup. And, for whatever reason, it just filled some unexplainable void in the press and the design blogs. It was picked up everywhere and we ended up with well over one thousand subscribers in the first two weeks. We were both excited and horrified, because we couldn’t possibly handmake one thousand things. 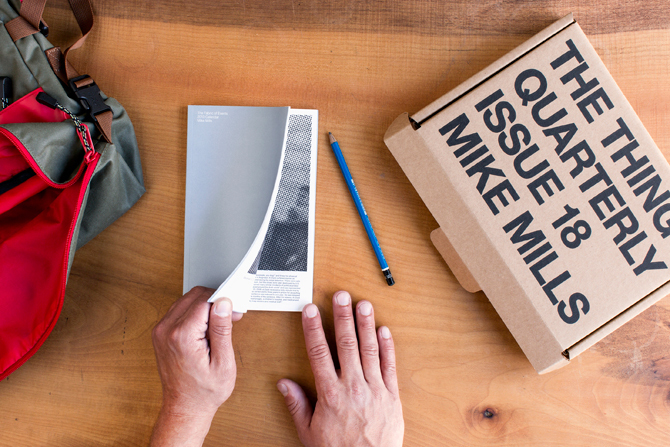 CK: How was the release of Issue 18 [Mike Mills] at Family Bookstore in Los Angeles? CK: Do you guys sell individual “issues” at something like that or only subscriptions? JH: We treat it so the model is like a magazine. Subscribers would receive the issue first, just as if you were a subscriber to the New Yorker; you get it before it goes to the airport. Or you better! Because if you show up at the airport and they already have the issue out and you haven’t received it yet, you are bummed. In this case, the issue had already been sent to the subscribers at the beginning of October and the event at Family Bookstore was the release to the public, so people could purchase it. However, we only have something like 50 remaining. CK: That’s a good problem to have. JH: The issue has done very well. We sold a bunch at the release and it’s in stores around the country as well. CK: There is a lot of dialog around the so-called dying print industry. You guys are reinventing this subscriber-based, printed distribution. What is your elevator pitch? JH: It‘s a periodical in the form of an object. 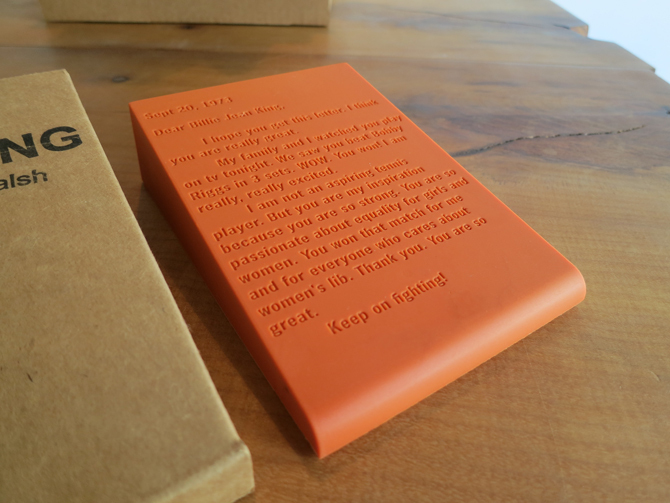 And that is like a magazine, but we publish writings on useful objects. CK: Do you expect people to actually use the objects? Or do you hope people put them on their shelves as cherished objects? JH: We prefer that people use them. That’s the whole idea. The doorstop, for instance, is just a solid piece of rubber. The ultimate doorstop. It’s screaming to be put to use. Mike Mills’ issue is a calendar, but it also serves as a sort of statement by Mike…a thesis, on how the larger fabric of cultural history defines us as individuals. Yes, we want people to use these things, but we understand that there are collectors out there who are not using them, and that’s alright too. CK: Do you know anyone who has two subscriptions and is holding one and using the other? JH: Oh yeah. There are a lot of people like that. And there are also several institutions that are collecting the entire run of THE THING. So we know that it’s being collected and that is exciting. But we like the fact that it is troublesome. That: a) Is it a periodical, really? Or some sort of limited edition? It’s neither so it’s already a problem, and b) is it a useful object or a collectable object which makes it another problem? It’s a real wrestling match every time. CK: Do you actively dialog with any schools or institutions about self-publishing or alternative publication models? Have you been asked to speak at schools? JH: Yes, we have done a lot of stuff like that. We just did one recently at the San Jose Museum of Art. But we also taught a course here at CCA [California College of the Arts] in the Design department. CK: Have you guys had exhibitions that have solely featured the entirety of THE THING collection? JH: No, we haven’t and it doesn’t feel right to do something like that. We’ve shied away from that. We did a residency at Artist Space in New York and we decided that, instead of exhibiting artwork, we would bring in someone else’s collection, and that was a better way for us to negotiate that. When we’ve been asked to participate in exhibition-type scenarios, we end up trying to figure out how we can pull other people in instead of what we’ve done. Same with Chronicle. We are doing a book with Chronicle Books that is coming out in 2014. Our initial conversation with them was that we did not want to do a retrospective of THE THING. We wanted to do something that really examined the book as a project space, and they were all for it. Again, trying to think ourselves into a problem, opposed to the standard model of just showing what we have done. CK: You use this project as a tool for collaboration. How do you go about choosing participants? JH: We talk about it endlessly. We have a list of people who we want to be involved. We’ve started to become more comfortable as editors now that we see this as a more long-term project. And it’s really thinking about how the four people fit together each year and what the balance is between object makers, writers, filmmakers, architects, etc. Then, outside of those descriptions, who are the people that we would love to work with and will rise to the occasion of doing something unconventional like this, regardless of their background? But we do get people who submit ideas. Starlee Kine, who is a radio personality (a lot of people know her from This American Life), approached us with a project that we were so excited about that we just said, “YES!” We knew her work, but didn’t know her personally. And that ended up being one of our favorite issues. It’s the cutting board about a lover’s breakup. It’s for cutting onions on, and one is supposed to cry about the loss while one cuts the onions. CK: You typically do release events and have a storefront here in San Francisco. How much of your efforts are focused on face-to-face interactions with people like that? JH: We are trying to do that more and more. Projects that take place throughout the year instead of only four times a year. 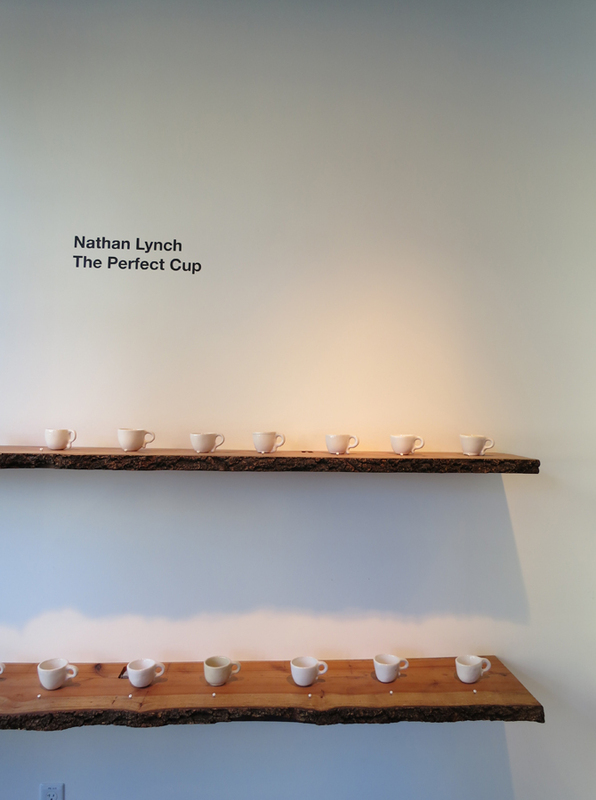 Right now, we have Nathan Lynch doing an ongoing, three-month project wherein he is trying to make the perfect espresso cup with his hands instead of spinning it on the pottery wheel. So, it’s a bit of a beautifully hopeless project. We have the cups in here and people come in and fill out a form based on the characteristics of thirty different cups. The idea is that they are providing Nathan with the vital information for his quest for the perfect cup. So there is that kind of stuff we are doing. But we haven’t utilized our office as well as we should. We both teach and have other jobs, so we are pretty maxed out. People come by and pick up their issue, which is great, but we do want to do more things. We want to sponsor more events, we want to get more involved in creating a larger dialog around our interests, but for now we are huddled around the idea of this subscription-based model until we can really think more broadly. CK: Outside of that space, you guys have individual art practices as well? JH: Yeah, I know Will has an artist studio in his house, and I have an artist studio that is in my computer. Will has work up right now at The Wattis in San Francisco. And I have work up at SITE Santa Fe. CK: Since you started this project five years ago, do you find yourself changing the way your art practice works, based on the decisions you make on THE THING, or do you compartmentalize? JH: I can’t answer for Will on that, but yes, I can’t imagine how it could not bleed over. The way I approach my own work, the way I think about what I’m doing definitely feeds into the way I have been thinking about THE THING. One thing that we realized is that when you are in school or an institution and you’re studying art, it’s very idealistic, and the reality of the world is not that idealistic. I think a lot of artists end up falling off because they come up against the hard reality that a gallery is actually a store. And it’s not really that easy to make money doing art, so you have to come up with another way to make a living. All those are things that we don’t know when we are studying and we don’t talk about. Part of what THE THING has done for me is introduced a more pragmatic element into my art practice, where I think idealistically about what I want to do and then pragmatically about how I can accomplish it. And that is not the most romantic way to think about things, but thinking this way helps me keep doing what I want to do. CK: You talked about school briefly. Did you study Fine Art or Design? JH: Neither. I studied Theater at Boston University and then transferred to Political Science when I discovered Howard Zinn. He was teaching there at the time, so I just threw in all my marbles with poli sci. After that I had various jobs. I taught high school for five years. I went back and got my MFA at Berkeley, where I met Will. It’s a Fine Art program, but you basically have access to the entire campus and all the classes available at the school. I chose to spend most of my time at the Pacific Film Archive and that was amazing. But obviously, the experience of school is one thing and the experience of the real work is quite another. CK: Do you think you would have landed in the same place if it weren’t for that schooling? JH: Well, if I hadn’t gone to Berkeley, I wouldn’t have met Anne Walsh, who was a professor of mine, and who was extremely influential in her thinking. She blew me away. And I wouldn’t have met Will, so we wouldn’t be doing THE THING. So it wasn’t the conceptual ideas that we threw around at Berkeley. It was more being in the place that was isolated from the real world and you can throw around ideas, which is great fun. It is such a luxury in many ways. But I was able to really rethink a lot of the things that I was considering before that. CK: Do you guys consciously make an effort to manufacture in America? JH: Well, we began with this terrible curve of “we have to figure out how to get this stuff made, immediately, because we are not making it by hand.” So we were not immediately thinking where we would make these items. It was not a priority. It wasn’t until Starlee Kine’s issue that we actually had a physical hand in the making. We made it here in San Francisco at Luke Bartels’ Woodshop, and it was a great experience, but we were lucky to come out without losing a thumb. 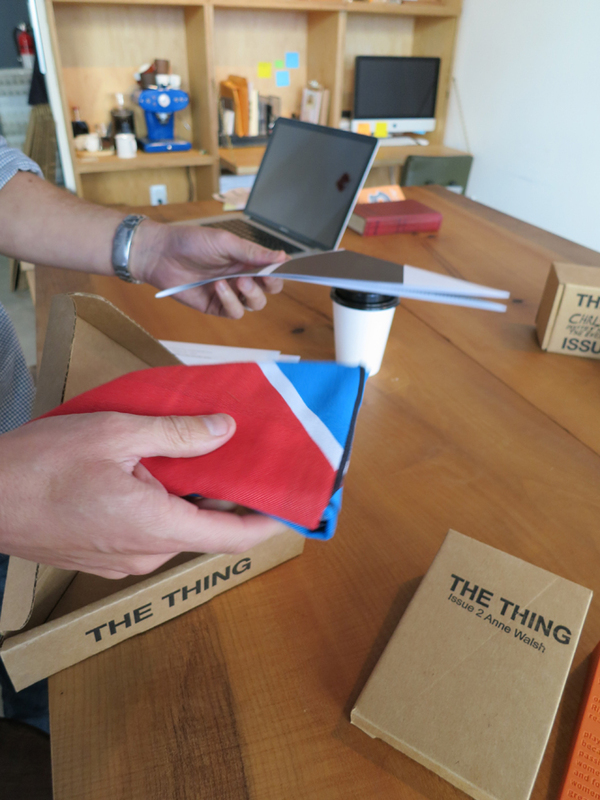 Now we think more aggressively about working with people who make stuff in America. Ideally in California and even more specifically in the Bay Area, so we can go see what they are doing and talk to them and change things. But, there are things that just aren’t made in America, like the Dave Eggers shower curtain issue. Believe it or not, there are not any shower curtain manufacturers in America that don’t cost $90 a piece to produce, which is unrealistic. So we had to make a decision on that one to go overseas. We worked with Izola, a company in New York that makes designer shower curtains and they were great guys. They made them at their factories in China. But I would say in the grand scheme of things that is just the way it needed to be done for that particular issue. We wanted to make this Mike Mills issue in the US or in North America and we ended up going to The Prolific Group in Canada. And that was a great experience. It was perfect for us. So to clarify, ideally, we would like to make everything in the United States. But the reality is that our issues are priced really low for what they are and there is always a learning curve to what we are doing. We try to find small manufacturers who are doing really cool things and match them up with the contributor. That’s our ideal situation. CK: What is the most challenging request you guys have gotten from a contributor? CK: What do you guys feel that you produce at THE THING? JH: Well, I think it goes back to the very beginning, when we wanted a “magicness” or “specialness” that objects are instilled with. It’s like this rock my daughter gave me once. It looks like any old rock, but because she gave it to me, it has this “specialness” that only I know. And I carry it with me all the time. I think THE THING is about the stories, history and personal experiences we associate with objects, which we carry with us always. And, as objects disappear more and more, I feel like it’s important that at least I participate in something that is trying to do that. Something that is trying to make an object special. We don’t make a ton of these, we make just enough, hoping that the people who receive them think about the object and use it, and it develops this story that goes along with it. And maybe they hand it to someone else over time and the story continues. But it’s all about developing this “specialness”. JH: Well, we are in pre-production for all three of our upcoming issues. We have a great lineup. But on a larger scale, we’re at the point where we’re really starting to think about how we can turn this into our job rather than it staying a side project, and that has us thinking about what THE THING is becoming as it morphs, because it is constantly morphing. We are starting to see ourselves as this strange incubator for art and design, which sounds kind of cliché, but not in a comfortable way. In a way that’s not oriented around the consumer, but is practice-oriented. Jonn Herschend is an interdisciplinary artist, filmmaker and experimental publisher whose work explores fiction, reality and the narrative structures that we employ as a way to explain the chaos and clutter of our everyday lives. He is the co-founder and co-editor, along with Will Rogan, of the experimental publication THE THING Quarterly. Chad Kouri is a Chicago-based artist. With equal interests in conceptual art, ethnography, typography, design, jazz and the gray areas between these fields, his body of work is a collection of various ongoing projects, thoughts and experiments tied together by a strong sense of composition, concise documentation and an overall vibe of optimism.